In the week before Christmas, 2017 three of our Sisters were advised that they had been bestowed with the Papal Honour of Croce pro Ecclesia et Pontifice. The Sisters are Sr Anthea Groves, Sr Jacinta Fong, and Sr Sesarina Bau.The honour, created in 1888 by Leo XIII, is the highest medal that can be awarded to the laity by the Pope. It is a recognition of services done for the Church and its head. The Archbishop of Sydney, Anthony Fisher op, will present their honours to the Sisters on March 9, at 9.30 am in the Chapter Hall next to St Mary’s Cathedral. A morning tea will follow the presentation. 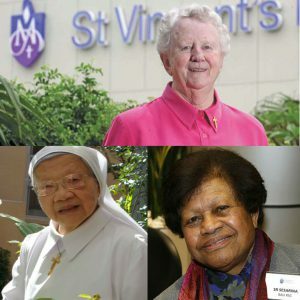 Sr Jacinta and Sr Sesarina both continue to minster at St Vincent’s Hospital in Sydney’s Darlinghurst; Sr Anthea concluded her ministry there just before Christmas. For images of Sr Anthea’s farewell guard of honour from the campus, click on this link. Two other Sisters of Charity have received this honour – the late Sr Veronica Brady, and the late Mother Marion Corless.